Drawing Instead of Rolling and WOOTW #73 | Robert Mitchell Jr.
← 99 cent Sale — 24 Hours Only! A few weeks ago I promised to explain the new element I added to my workout system — the little wooden paint stirrers you see on the right. The basic idea is that the workout regimens of martial artists, who need to be ready for anything, should include an element of randomness. I used to introduce randomness by rolling dice of various kinds, and I still do use them for inspiration. But the problem with dice is that they’re a little too random. Let’s say you workout six days a week and every day you roll a six-sided dice to determine your workout. Your chance of rolling a 6 once/week = 6 x 1/6 or 100%. That’s what’s called “odds on.” But what happens is that you’ll roll 6 twice in one week with surprising regularity, and you’ll skip a week rather often too. Every dice roll is completely independent of the last. But if you write numbers on six paint stirrers and pull one out of cup each day — and you don’t put it back the cup is empty — you know you will get a 6 once per week. And only once. That’s why I went with the new method. Now I have 12 sticks in a cup, each one with a different focus written on it. Depending on how much time I have on a given day, I pull a stick or two from the cup and get to work. 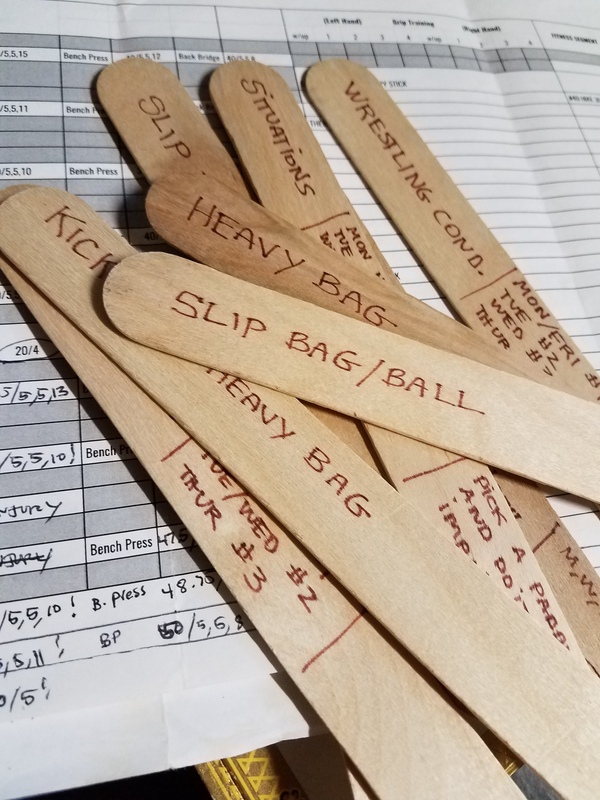 And since I leave sticks out until the cup is empty, I get the randomness I need while making it impossible to go more than six to twelve days without working on each one of the twelve items. Did you enjoy reading this? Then the Cabal Fang book will blow your mind. Buy a paper copy on Amazon or from Createspace or download the ebook here. This entry was posted in Martial arts and tagged random workouts. Bookmark the permalink.